My approach to crafting solid UX is to rely on the basic elements, that forms the building block of good design. This proven process allows me to bridge the gap between business goals and user needs. Always the first step, where I get to know the business and the market they are in and the audience they are targeting. Using methods such as domain / market research, competitive & comparative analysis, organization research, contextual inquiries, user interviews and surveys allow me to collect both qualitative and quantitative data. In this stage I develop information architecture to help create a user flow to meet MVP (Minimum Viable Product) of the user. Other planning methods include user flow, site map, user stories, scenarios, journey map and story board—all of which allows me to empathize with the user. 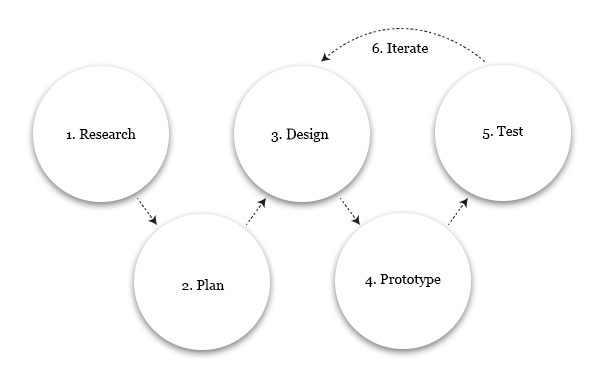 The planning stage sets the tone and path for me to start my design process. From low-fidelity wireframes on paper (quick and inexpensive modifications) to mid-fidelity and high-fidelity wireframes built in light weight apps such as Sketch or Principle for Mac. Full understanding of responsive website design, Material Design and iOS Human Interface design. Prototyping is a great way to bring my design to life and test it’s functionality. From the business side, stakeholders get excited about what the product could look like. It also helps me to communicate with the development team in how to implement certain design decisions. MarvelApp and InvisionApp are my go-to apps, along with Adobe XD CC, Principle for Mac and Framer.js. User/Usability testing is one of my favorite parts of the UX life cycle. It helps me to see if my hypothesis was correct in helping solve user’s challenges. Having the testers talk out loud, whether in person or remotely, allows me to gain valuable insights into their thought process. It is an excellent way to receive feedback from stakeholders, peers, users and mentors to improve the design. There is always room for improvement and testing allows just that. Learning from user-testing, I get to go back and improve on my design, where testers had trouble completing the task. UX design is a process that is continually evolving—even if it has been shipped, uploaded or live. In one way it is kind of the beginning where the product you have spent valuable time and effort on, is in the hands of real users.